Dang, you guys, it's a love story! I got snookered! I thought it was a winter wilderness survival story, à la 1993's Alive or 2015's The Revenant. As love stories go, it's pretty lame. There's not much chemistry here. 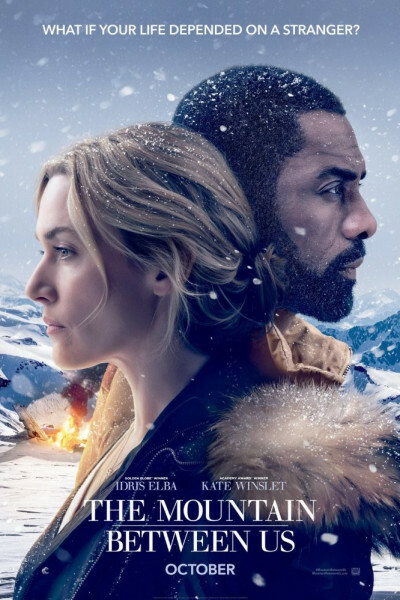 Elba is a wooden statue, and Winslet acts like Steve Carell's Hammy from Over the Hedge: super-hyper, aimless, and hurrying en route to nowhere in particular. As a SURVIVAL/ADVENTURE tale, it's even worse. Alas, it sits at 6.0 on IMDB, and that feels about right. It's no better, and perhaps a smidge lamer, like, say, a 5.8? Anyhoo, my wife says I shoulda seen it coming (she did) but, silly me, my tiny turtle brain didn't perceive that from the trailer, and I was unaware it was built around a romance novel by someone named Charles Martin (who also wrote Where the River Ends). I thought there'd be some Rambo stuff, ya know, like setting makeshift traps and eating bears and sleeping in their carcasses but, instead, it's mostly cuddling "for warmth." Between Battle of the Sexes and now The Mountain Between Us, October is feeling uncannily like February!